If yesterday was a fantabulous day on land, today was equally wonderful out on the water. 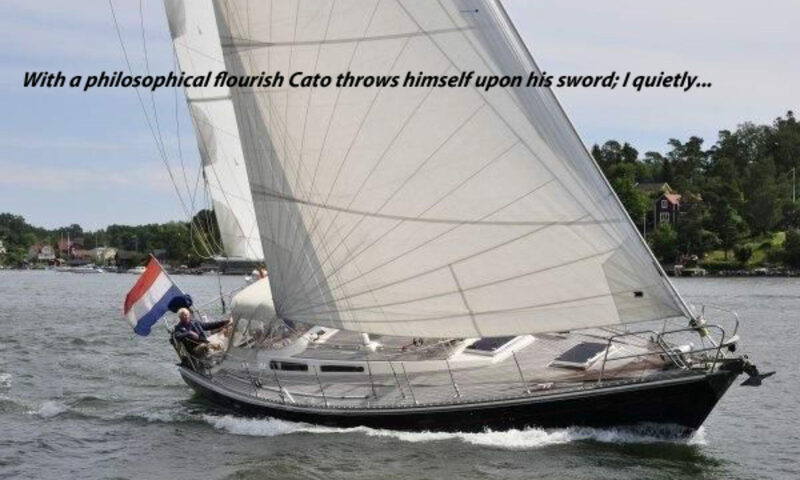 That’s right: Further and I went for a sail. 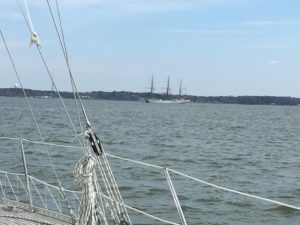 We left the dock around lunchtime (after successfully filling up on diesel, unlike our last outing) and wandered out into a light-air day on the Chesapeake. Winds were 6 to 8 knots so we were ghosting along under main and genoa at 4 knots or so. Not blindingly fast but the sun was shining, the air was warm and it just felt GOOD. Further, especially, seemed pleased to be back in her element. We headed easterly toward the Bay Bridge and were off Greenbury Point when the wind pretty much died out: 3 to 4 knots and we were doing maybe 1 or so. There was a J World sailing school boat nearby and they were going just as slowly as we were so I didn’t feel bad about it. At one point I wandered up to the bow and looked over the edge just to make sure. I could confirm that Further was, in fact, cutting through the water. We were moving. And then we were moving a bit faster. And then a bit faster still. What the…? By the time I got back to the cockpit the breeze had filled in, blowing in the 10 to 12 range and Further was doing a good 6 knots. It was amazing how quickly everything changed. One minute we’re just floating, the next we’re rocking across the bay. 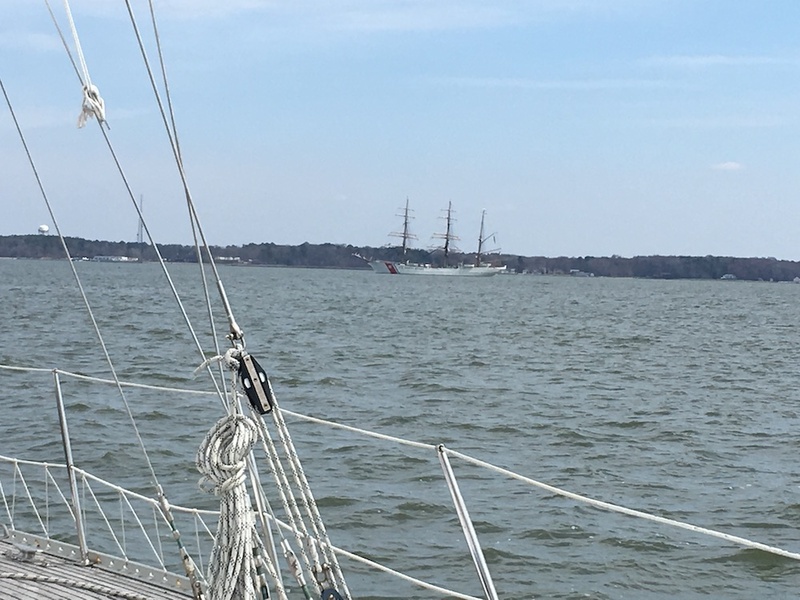 The USCG cutter Eagle doing “engine maneuvers” on Chesapeake Bay. Click on the photo to enlarge it and see how beautiful a ship she is. And out there on the bay, in the main channel south of the Bay Bridge, was the U.S. Coast Guard cutter Eagle (which, I just learned on that page I linked to, when it was brought to the U.S. after we took it from the Germans following World War II, came first to the town in New York where I spent a good chunk of my youth. Far out!). They had announced over the VHF that they would be doing “engine maneuvering” for about three hours so Further and I moseyed over there to get a look. This being the Paranoid States of America I didn’t get too close, the Eagle being a military ship and all, but even from a distance she sure is a beautiful vessel. I’d love to see her out at sea with some of her canvas flying, but even under bare poles she’s a pretty vessel. After getting to roughly the eastern edge of the channel, I tacked Further over and we headed back to the southwest, toward Thomas Point. The wind by now was a steady 14 to 16 with gusts up to 20-plus and we were rockin’. In fact, I may have had Further a little overpowered but what the hell…it was our first time out this year, really. And it was sunny. About halfway back to the western shore I did roll in a bit of the genoa, but other than that we just rocked and rolled. Another tack and back northeast toward Eagle, then another tack to head back to Annapolis, and by now the wind was a steady 20. Boo-YAH! 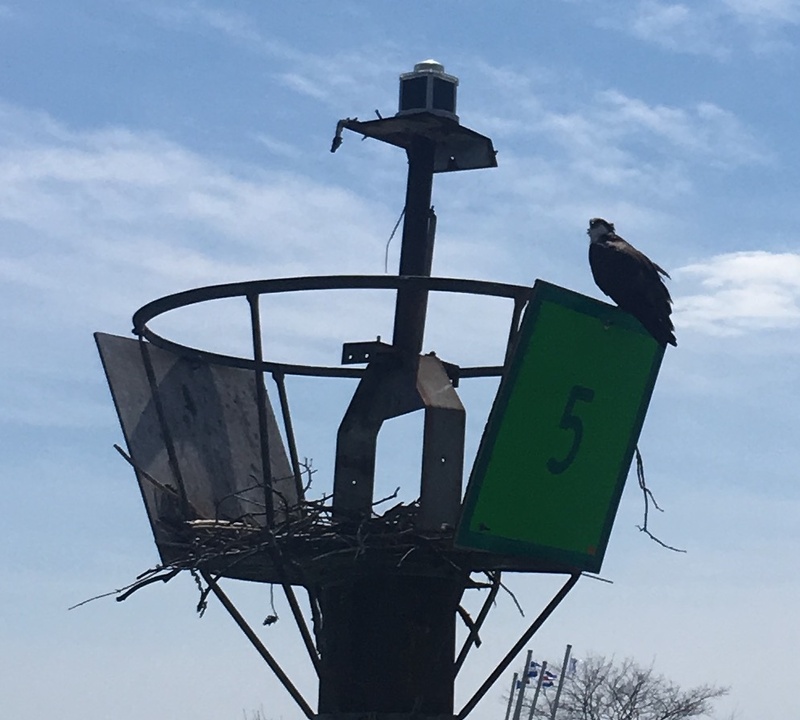 The ospreys are back and once again building their nests on pretty much every navigational aid in the area. A sure sign of spring. Off Back Creek I turned into the wind and started the engine so I could roll up the jib completely and douse the main. Coming into the marina was pretty straightforward, though the strong southerly wind would have made it interesting to tie Further up by myself. As it was, the guy on the boat in the slip next to ours was on the finger pier to help. So, yeah, here we go into another season. I had hoped that by now I’d have a dozen or so days on the water but the weather and Further‘s diesel engine had something to say about that plan. No worries, though. We’re underway again and I’m stoked. I know Further is too. I will say that as much of a solo guy as I am, it would have been nice to have a friend or a few friends along for the ride. So if you’re in the mood to get in a little sailing, gimme a shout and c’mon down to Eastport. Further‘s a-waitin’.